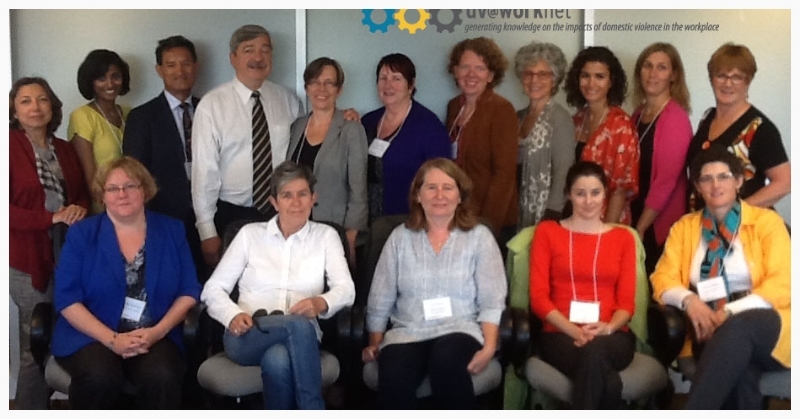 Experts from around the globe gathered in Toronto this past September to start up the Domestic Violence at Work (DV@Work) Network. The meeting resulted from a successful initiative by the Centre for Research and Education on Violence Against Women and Children (CREVAWC) to obtain funding from the Social Science and Humanities Research Council of Canada (SSHRC) to create a Canadian-led international network of researchers, domestic violence experts, social and labour organizations, and employers to conduct research and mobilize knowledge about the impacts of domestic violence in the workplace. Domestic violence is increasingly recognized as an issue that impacts not only individuals and families, but communities and society as a whole. Victims and perpetrators of domestic violence have multiple life roles, including, often, that of worker. Mounting evidence indicates that the impacts of domestic violence on workers and workplaces, including its economic costs, are a significant and growing problem. The primary goal of the network is to accelerate the development of the emerging knowledge base on the issue of domestic violence in the workplace. Partners and collaborators reviewed existing comparative data on domestic violence in the workplace and discussed priorities for further research, policy and practice and knowledge mobilization. We had thoughtful discussions, connected with each other about the important work happening in the field of domestic violence and the workplace and planned next steps. There is a lot of work ahead of us, but we couldn't have asked for a better starting point than our two days of intensive meetings. Ultimately, stronger evidence and international comparative data will help to shape legislation, policies, and practices that promote domestic violence prevention and safety in workplaces. The network includes 8 partners and more than 50 collaborators from 8 countries. The development of an international labour standard governing gender-based violence in the workplace is integral to promoting gender equality and ensuring safe work environments globally. Worldwide, 35% of women experience violence in the workplace and 40-50% of women experience some type of sexual harassment at work. The process for establishing an international labour standard begins at the International Labour Organization's (ILO) annual International Labour Conference (ILC). Members of the ILO Governing Body meet at the ILC to create conventions that are established as international labour standards. An international standard will contribute to policy development at the national level, as member countries must submit conventions adopted at the conference to their legislatures for possible ratification. The convention becomes legally binding to the country if ratified. However, getting gendered workplace violence on the ILC agenda has proven to be an arduous task that requires the consensus of government, worker and employer organizations from the 185 member countries. Though the proposal for a convention has been strongly supported by worker organizations, it has faced opposition from employer groups and not enough support from governments. An opportunity exists to advocate for the proposal, as the Governing Body will reconsider it mid-November 2014 for possible placement on the 2017 ILC agenda. It is crucial that members of the Governing Body come to a consensus to place the issue on the agenda. Learn more and get ideas on how to take action on this issue. Circulate to your networks to help governments and workplaces establish policies to prioritize the prevention and eradication of gender-based violence. Following the 2009 ILC, the ILO published a working paper that outlines best practices for eradicating gendered workplace violence. The Governing Body document with the proposal for an agenda item on violence against women and men in the world of work is now listed on the ILO public website. Ludo McFerran has worked in the domestic violence sector since the 1970s with one goal - to minimize the impact of violence on the lives of women and children. During the 1990s, as Chair of the National Domestic Violence Peak Body in Australia, she developed the policy to support victims to stay safely in their own homes. In collaboration with the Trade Union Movement, she initiated the concept of domestic violence paid leave and protection at work through collective bargaining. She in an Adjunct Lecturer at the University of New South Wales attached to the Gendered Violence Research Network. McFerran takes a multi-faceted approach to domestic violence, and is keenly aware of the overlapping oppressions that underlie the problem. "I believe that we can do little to reduce the rates of domestic violence because it is a symptom of a much bigger problem - how women and children are treated in our societies," admits McFerran. "But we can reduce the impact on the lives of individuals by reducing homelessness and unemployment." [Peter Jaffe, Academic Director at the Centre for Research and Education on Violence Against Women and Children (CREVAWC)] says Ludo's contribution to the field of domestic violence is immeasurable. Ludo is a trailblazer. She was one of the earliest and strongest voices calling for more attention to the issue of domestic violence, particularly in regards to the impact in workplaces," said Jaffe. "The entire sector owes her a huge debt of gratitude, and we are immensely privileged to have her as a part of the DV@Work Network." An Australian collaboration between the domestic violence sector and trade unions has formally recognized domestic violence as an industrial issue requiring industrial solutions. "Our collaboration has been to create a standardised approach by Australian workplaces that is non-discretionary and enforceable, protecting Australian workers experiencing domestic and family violence to stay in their jobs, in their communities and in their homes," says the press release introducing the plan. Ludo McFerran, a key actor in the initiative, explains the growing awareness that motivated the partnership. "In the early years of the twenty-first century support programs and policy across most Australian states developed to support a 'safe at home' strategy. I was immediately struck by the large numbers of working women seeking support and the stories they told of the critical role of their workplaces, providing practical and moral support. By this point we had been engaged with business for about fifteen years to encourage voluntary policies to support employees, but the take up rate was patchy," said McFerran. "I thought it was timely that the Australian workplace became a part of the community response to domestic violence by providing standard and enforceable protection, but I realised that this was the work of trade unions rather than employers." McFerran said the labour organizations she approached "got it immediately." Of the many initiatives taking place under the partnership, collective bargaining clauses, are garnering the most attention. Clauses that made front page news in Australian papers include the provision of additional paid domestic violence leave, and the negotiation of up to twenty extra days. For more information, the entire press release announcing the news is online here. Futures Without Violence is an American based non-profit organization that provides programs, policies, and campaigns that empower individuals and organizations working to end violence against women and children around the world. Workplaces Respond to Domestic and Sexual Violence is a National Resource Center project created by Futures. It offers information on the Internet for the benefit of those interested in providing effective workplace responses to victims of domestic violence, sexual violence, dating violence and stalking. An interactive website provides the user with relevant, comprehensive organizational resources on domestic violence and tools to create workplace policy. Moreover, the website provides links to partner organizations within the U.S. that have compiled employment guides based on state and local laws concerning domestic violence, sexual assault and stalking, and listing employment on orders of protection. Employers and unions have many opportunities to implement policies and programs to effectively respond to employees affected by domestic violence. Employment legislation in the United States protecting those affected by domestic violence is gaining momentum. It can provide the foundation to increase economic and personal security for victims, and ensure safety and productivity in the workplace. Currently, there is no federal legislation that protects victims from employment discrimination or mandates support in the form of paid leaves, when the consequences of domestic violence intersect with employment. However, several states and local jurisdictions have begun to implement laws that support employees in the workplace through anti-discrimination policies and enhancing employment security by providing job-protected leaves for victims. As well, there is federal legislation that allows for victims to use sick leave for domestic violence purposes. Additionally, over half of the states have enacted laws extending access to unemployment insurance benefits to survivors. And as awareness grows, many organizations have developed resources for those affected by domestic violence in the workplace. While DV @ Work is developing its website, you can send information or inquiries to juliemisener@execulink.com or communicate with us via LinkedIn here.